Mammography has proven to be an effective, cost-effective screening exam, which has reduced breast cancer mortality. Several technical modifications have been made to mammography since evolving from xeromammography to the development of screen-film mammography and full-field digital mammography (FFDM), and now digital breast tomosynthesis (DBT). Digital breast tomosynthesis continues to expand in clinical practice. The established sensitivity and specificity of screening mammography are 83.5% and 90.9%, respectively. Tomosynthesis is the newest development in hopes of improving these numbers. Tomography is a well-known technique in radiology that uses motion to better exhibit relevant anatomy, while allowing superimposed structures to fade. The most pervasive example today is computed tomography (CT). More recently, this same concept has been applied in breast imaging with the development of breast tomosynthesis. Interest peaked late in the 1990s when flat panel detectors became available.1 In 2011, Hologic, Inc. (Bedford, MA) received FDA approval for the Selenia Dimensions 3D System, a 3-dimensional (3D) system, which is the sole FDA-approved breast tomosynthesis system to date. 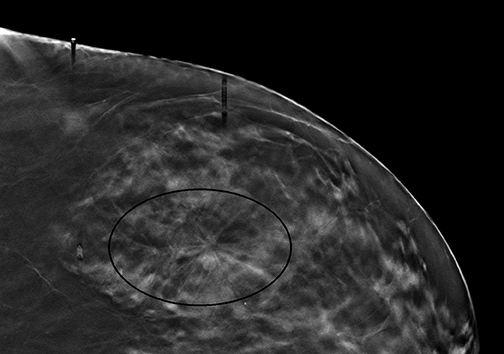 This system uses low-dose images to create cross-sectional images of the breast. As stated by the FDA, “the 3D images provide additional information to help physicians detect and diagnose breast cancer.”Additional DBT systems are currently under consideration by the FDA. It should be noted that the Hologic Selenia Dimensions DBT unit builds upon the 2D standard digital mammography unit. Therefore, a tomosynthesis sweep can be obtained in nearly all of the diagnostic views. Magnification views for the evaluation of microcalcifications cannot be obtained using tomosynthesis, and these should be evaluated with standard 2D magnification views. While the morphology of microcalcifications may be better demonstrated with magnification views, the distribution of microcalcifications is effectively imaged with tomosynthesis (Figure 1). 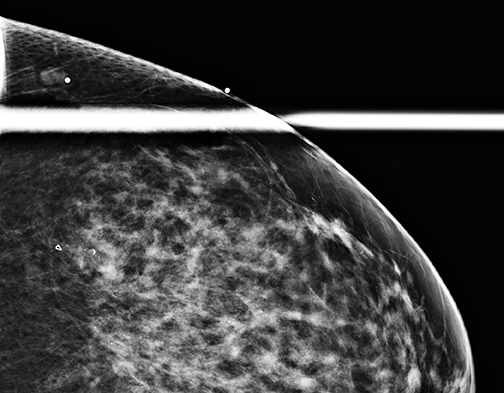 In clinical practice to date, screening mammography may include breast tomosynthesis, but it also requires the 2 standard 2D mammographic views of each breast. The dose is about twice that of the digital view alone; however, total dose of both exposures is still less than the U.S. Food and Drug Administration (FDA) dose limit of 300 mRad/exposure. Moreover, the increased dose approximates the dose of standard screen-film mammography, and it is felt that this slight increase in dose is acceptable allowing for an increased cancer detection rate, fewer additional views,and decreased recall rate. In May of 2013, Hologic received FDA approval for its C-view 2D imaging software. This software addition to the DBT package allows reconstruction of a 2D mammographic image from the acquired tomosynthesis data. This negates the necessity of standard mammographic views in addition to the tomosynthesis projection data. Ultimately this allows for a decrease in patient dose and less time under compression for the patient. C-view 2D imaging software has been available in Europe, many countries in Latin America, and Asia since 2011.C-view software will be available as an optional package to new and existing customers in the United States. Gur et al found that there was a lower sensitivity and similar specificity in interpretation of synthetically generated mammographic images in comparison to FFDM, when both are combined with DBT. In this study, 10 radiologists retrospectively interpreted 114 mammograms in 2groups. One set included FFDM and the other set had the synthetically generated mammograms. Both sets included DBT. The conclusion was that “improved synthesized images with experimentally verified acceptable diagnostic quality will be needed to eliminate double exposure during DBT based screening.3” While there is direction for the role of DBT in the screening population, the utility of DBT is less well established in the diagnostic setting. The authors’ experience and function of DBT are described below. In recent years, several articles have been published describing experience with tomosynthesis. Initial experience by Skaane et al concluded that that DBT increased the sensitivity for detecting cancer, including those presenting as spiculated masses and distortions.4 Moreover, the authors expressed that for DBT to be successful it would have to increase the conspicuity of cancers versus FFDM and detect malignancies that may be overlooked by traditional mammography. A subjective comparison of DBT and FFDM in the diagnostic setting was examined by Hakim et al.8 This small study, which evaluated50 cases, concluded that tomosynthesis in the diagnostic evaluation may reduce the number of diagnostic views for lesions that are not solely calcifications. 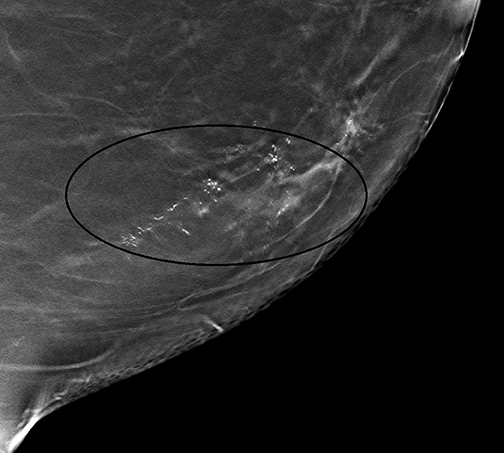 In 12% of cases, the radiologists indicated that tomosynthesis would avert the need for ultrasound.8 Similar findings, reported by Brandt et al,9 indicated that in evaluation of noncalcified findings that were recalled “2-view DBT was considered adequate mammographic evaluation for more than 90% of the findings.” It should be noted that additional views to discern the location of a lesion only seen in one view are unnecessary when they are seen on one tomosynthesis sweep. Workstation software guides the interpreter to the craniocaudal and medial-lateral location of a lesion, so the exact location is known. A targeted ultrasound may then be performed, if indicated. Gur et al also noted that DBT had the potential to decrease recall rates, although the results were not statistically significant.8 The authors found that tomosynthesis decreased the recall rate by 10%, but it did not improve sensitivity, without or with standard FFDM.8 Also of note in this study was the time required to interpret and issue a report for a combination study versus standard mammography. It took the observers nearly twice the time to interpret combined FFDM and digital breast tomosynthesis (2.39 minutes) versus FFDM (1.22 minutes). This is an important consideration in the practice setting when initially integrating this new technology into one’s practice. Most recently Rose et al10 have explained their experience following introduction of tomosynthesis into their practice. In an observational study, they compared multiple variables and outcomes before and after the introduction of tomosynthesis into the practice. These included recall rates, biopsy rates, positive predictive value, and cancer detection rates of 6 interpreting radiologists, and these figures over a 9-month period following tomosynthesis were compared to same variables prior to tomosynthesis. Recall rates for these 6 radiologists decreased to5.5% for mammography including tomosynthesis, versus 8.7% for mammography alone.10 Furthermore, the PPV for the recalled patient increased 4.7% to 10.1%. Authors also noted there were not significant changes in biopsy rates and cancer detection rates. To date, the role of breast tomosynthesis has been established in the screening population. There is an increase in the cancer detection rate,while decreasing the recall rate in the screening population. However, the role of tomosynthesis in the diagnostic setting is less well established.Hakim et al found that tomosynthesis may reduce the number of additional views required in a diagnostic evaluation.8 However, even more basic questions arise when implementing DBT into one’s clinical practice. Considerations in the authors’ practice included the following questions: 1) Who will benefit from 3D? 2) How should 3D be charged? 3) Is 3D for screening or diagnostic patients? 4) How does 3D impact workflow? 5) How does 3D affect interpretation time? 6) How should breast tomosynthesis be offered? Should 3D be offered to all women or only those with dense breasts? Should patients with lumps or recalled patients be offered 3D? Furthermore, because tomosynthesis is not yet reimbursed by health insurance companies, is the cost absorbed by the practice or should the patient be charged a fee for the additional tomosynthesis to offset the additional interpretation and capital costs? Integration of new technology in clinical practice alters the dynamics and workflow of an established practice. For the radiologist and the technologist, there is a learning curve for a new modality. For those radiologists who are MQSA certified in standard mammography, theFDA requires an 8-hour training session. The courses are offered several times per year in various central locations across the United States,or as webinars, which may be more convenient for many. Additional requirements have also been established for mammography technologists and medical physicists. As noted earlier, the tomosynthesis portion of the exam, on average, doubles the interpretation time of the combination study versus a standard FFDM exam. Furthermore, miscalculation of the popularity of tomosynthesis has produced long waits at times for some patients. All of these factors require the need to examine a practice’s staffing requirements and scheduling procedures. The authors have addressed some of these considerations in our practice. Breast tomosynthesis is offered to all screening patients. There has been an aggressive educational campaign for our patients and referring physicians, and patients have been very receptive to the new technology. Regarding the reimbursement issue, we charge a nominal fee at the time of service if the screening patient chooses tomosynthesis. The fee was considered carefully, and the fees charged by regional practices were a consideration in establishing this amount. In the diagnostic setting, the patient does not get the opportunity to choose whether or not to undergo a 3D examination. Rather, the decision is left to the staff radiologist at the time the patient presents. The radiologist determines if standard 2D additional views or tomosynthesis is to be used for the recalled patient.Because magnification tomosynthesis cannot be obtained, tomosynthesis is used for masses, asymmetries, densities, and architectural distortions, and not for microcalcifications. 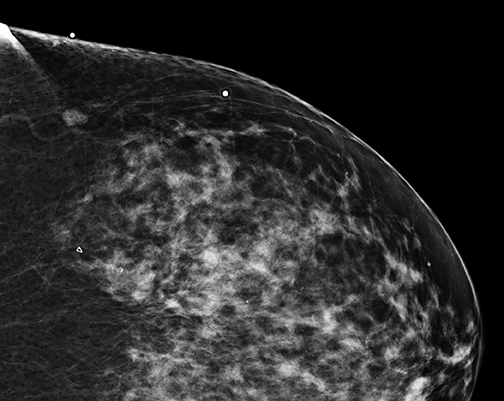 Radiologists may be hesitant to adopt breast tomosynthesis because of potential lesions identified only with tomosynthesis, and which are notperceived on standard 2D mammography or where no sonographic correlate is found. Figure 2 is one such example of what we have had in our practice. Hologic obtained FDA clearance for the Affirm Breast Biopsy Guidance System in January of 2013. Affirm offers upright minimally invasive biopsy systems.Experience with tomosynthesis biopsy remains limited. However, a series of biopsies over the course of 15 months in Europe led to 118 tomosynthesis vacuum-assisted biopsies. The lesions were reached in all cases except one. In a subset of 13 malignant lesions, 2D mammography failed to detect 8 of these lesions, and underestimated the number of calcifications in another 5 lesions. Complication rates were low, including 8 hematomas, one of which was associated with infection.11 As tomosynthesis technology continues to be adopted more widely, experience with tomosynthesis biopsy will subsequently increase as well. However, initial experience remains encouraging that tomosynthesis-guided biopsy will enable radiologists to sample suspicious lesions accurately and safely if only identified on 3D images. What is next for digital breast tomosynthesis? A few have speculated about a “compressionless” mammogram because DBT eliminates the superimposition of structures, which compression helps to diminish. Compression is used mainly to eliminate the superimposition of breast tissue for mammography; however, it also reduces scatter radiation and motion. 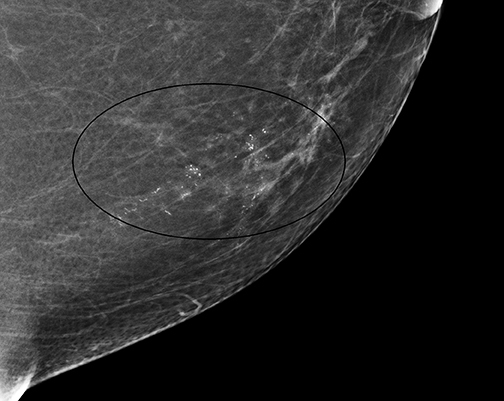 Furthermore, compression allows more breast tissue to be imaged within the field of view.2 Therefore,it is highly unlikely that tomosynthesis will result in a mammogram obtained without compression. The most pragmatic investigations ofDBT will be implementing it in the diagnostic setting, when a 2D screening mammogram is obtained, for the assessment of masses, densities, and asymmetries. Will radiologists prefer both CC and MLO tomosynthesis sweeps? Perhaps a mediolateral or lateromedial sweep? A single sweep? The answer is to come while the technology continues to evolve. Lastly, will contrast-enhanced dual-subtracted mammography be coupled to tomosynthesis so that we may have both anatomic and physiologic information on a mammogram? DBT has come to the forefront in breast imaging in a relatively short time. The authors’ goal was to highlight the clinically relevant issues with this new technology, explain the history which led to DBT, and outline possible future trends of digital breast tomosynthesis. The authors believe that digital breast tomosynthesis is a technology that is here to stay and is an additional valuable tool for radiologists in the detection of breast cancer. Dobbins JT. Tomosynthesis imaging: At a translational crossroads. Med Phys. 2009;36:1956–1967. Sechopoulos I. A review of breast tomosynthesis. Part I. The image acquisition process. Med. Phys. 2013;40:014302. doi: 10.1118/1.4770281. Gur D, Zuley MK, Anello MI, et al. Dose reduction in digital breast tomosynthesis (DBT) screening using synthetically reconstructed projection images: An observer performance study. Acad Radiol. 2012;19:166-171. Skaane P, Gullien R, Bjørndal H, et al. Digital breast tomosynthesis (DBT): initial experience in a clinical setting. Acta Radiol. 2012;53:524-529. Skaane P, Bandos AI, Gullien R., et al. Comparison of digital mammography alone and digital mammography plus tomosynthesis in a population-based screening program. Radiology. 2013;267:47-56. Ciatto S, Houssami N, Bernardi D, et al. Integration of 3D digital mammography with tomosynthesis for population breast-cancer screening (STORM): a prospective comparison study. Lancet Oncol. 2013;14:583-589. Gur D, Abrams GS, Chough DM, et al. Digital breast tomosynthesis: Observer performance study. AJR Am J Roentgenol. 2009;193:586–591. Hakim CM, Chough DM, Ganott MA, et al. Digital breast tomosynthesis in the diagnostic environment: a subjective side-by-side review. AJR Am J Roentgenol. 2010; 195: W172-W176. Brandt KR, Craig DA, Hoskins TL, et al. 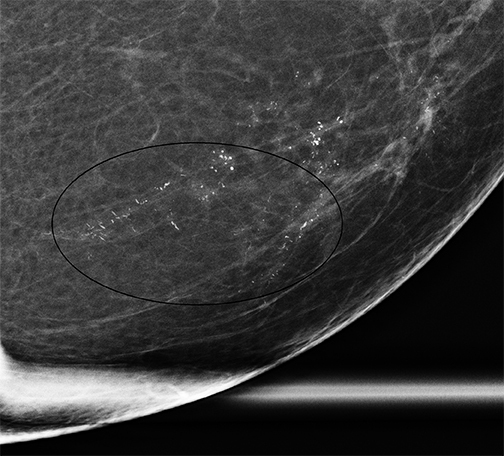 Can digital breast tomosynthesis replace conventional diagnostic mammography views for screening recalls without calcifications? A comparison study in a simulated clinical setting. AJR Am J Roentgenol. 2013;200:291-298. Rose SL, Tidwell AL, Bujnoch LJ, et al. Implementation of breast tomosynthesis in a routine screening practice: An observational study. AJR Am J Roentgenol. 2013;200: 1401-1408. Viala J, Gignier P, Perret B, et al. Stereotactic vacuum-assisted biopsies on a digital breast 3D-tomosynthesis system. Breast J. 2013;19:4-9. Basics of digital breast tomosynthesis. Appl Radiol. Dr. Shah, Dr. Ng, and Dr. Shaw de Paredes are at Ellen Shaw de Paredes Institute for Women’s Imaging, Glen Allen, VA. Dr. Shaw de Paredes is on the Editorial Advisory Board of Applied Radiology.